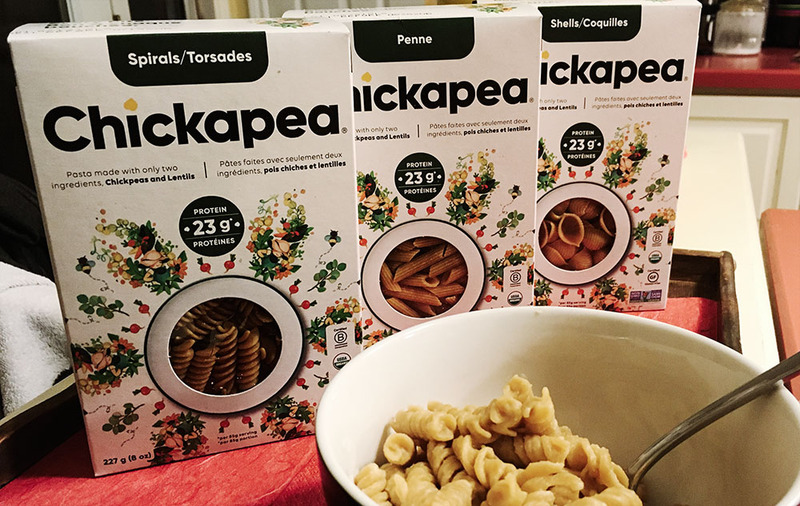 Chickapea, a Collingwood, Ontario company, makes gluten-free pastas with two deceptively basic ingredients: chickpea flour and red lentil flour. Launched in 2016, Chickapea believes you shouldn’t have to sacrifice quality and nutrition for convenience – and their organic gluten-free pastas and “Mac and Cheese” boxes deliver on that belief. They make plain pastas in three shapes – spirals, penne and shells. A fair warning to you all, cooking this is not like cooking regular pasta. Ours boiled over unexpectedly a few times because the pasta expands and breaks down faster than flour-based pasta. Though, to be fair, Chickapea gives you a heads up about the difference in cooking techniques right on the box. The taste is interesting, like unseasoned hummus, which makes sense since it’s made from chickpeas. It has a slightly nutty aftertaste. The noodles themselves are stickier than regular pasta, so it absorbs and holds sauce well. There is an odd mouthfeel caused by a grittiness in the pasta that you wouldn’t find in its flour-based counterpart. It’s also really dense, so you will feel full pretty fast. Each box makes two servings, so you’ll need more than one box for family of four. Chickapea also has a line of Mac and Cheese alternatives, made with a clean, organic cheese sourced from local suppliers. There are three dairy-based options: spirals and white cheese, spirals and cheese, and mac and cheese. We mixed in broccoli into their Mac and Cheese to add a bit of green to the dish, and it was delicious. They recently launched their Vegan Mac, which we’re looking forward to testing one day!